Wine Bottle Carrier comes with easy- to- carry handle. 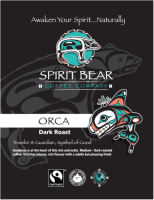 Rich and intense with notes of roasted nuts and a subtle finish. 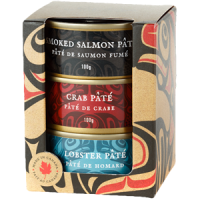 (Smoked Salmon, Lobster and Crab) packed in tins with easy-open lids, making them ideal for travel and gourmet picnics. 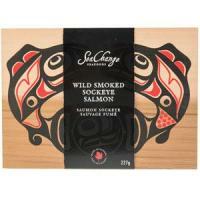 When buying a two pack its double the treat and it features original Haida artwork on the presentation box. 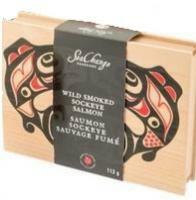 Made with wild Pacific pink salmon, considered the most sustainable of Canada’s six native salmon species. Cooked and ready to serve. 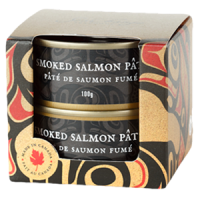 This wonderful taste of Canada is beautifully packaged in a decorative envelope for ease of travel and gift giving. Cooked and ready to serve. 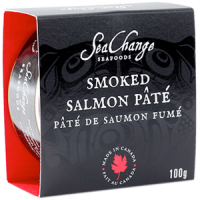 It is wonderful with cream cheese on an endive leaf. You can also use capers, splash of lemon juice and thin slices of red onion to garnish. Cooked and ready to serve. It is wonderful with cream cheese and a baguette. You can also use onions, capers, hard boiled eggs and dill sprigs to garnish.